You've probably heard of the mnemonic device FANBOYS for memorizing the seven coordinating conjunctions. Have you heard of A WHITE BUS for memorizing some of the subordinating conjunctions? I hadn't heard of it until a friend told me about it recently. I'll show you how it works! 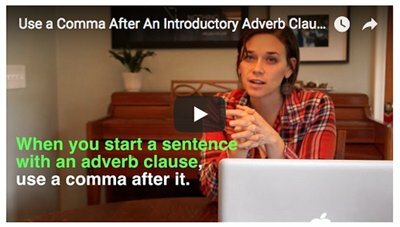 Subordinating conjunctions join dependent adverb clauses to independent clauses. There are many subordinating conjunctions. 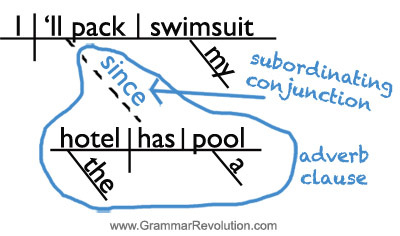 Looking at this sentence diagram will help you understand what these conjunctions do. 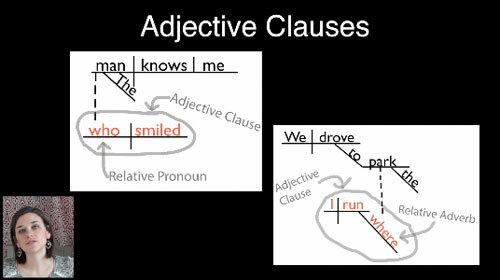 Do you see how it connects the dependent adverb clause to the independent clause? It's time to check out A WHITE BUS! Remember that there are many subordinating conjunctions, and this mnemonic only helps you remember a handful of them. Here's my version along with nine sentences. Would you like to print this out? No problem. Although we arrived on time, the bus left without us. Whenever this kind of thing happens, it makes me so upset! Our coach said we could get to the game however we wanted. If the bus company posts a schedule, they should stick to it. Though no one would call me punctual, we were there on time. Even if everyone was ready to go, they shouldn't have left early. Because we missed the bus, we might miss the game. Our coach will be upset unless we're there on time. Since this wasn't our fault, maybe he'll forgive us. 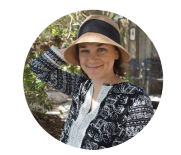 WARNING: These Words Aren't Always Subordinating Conjunctions! Did you know that most words can function as multiple parts of speech? It's true, and these words are no exception. 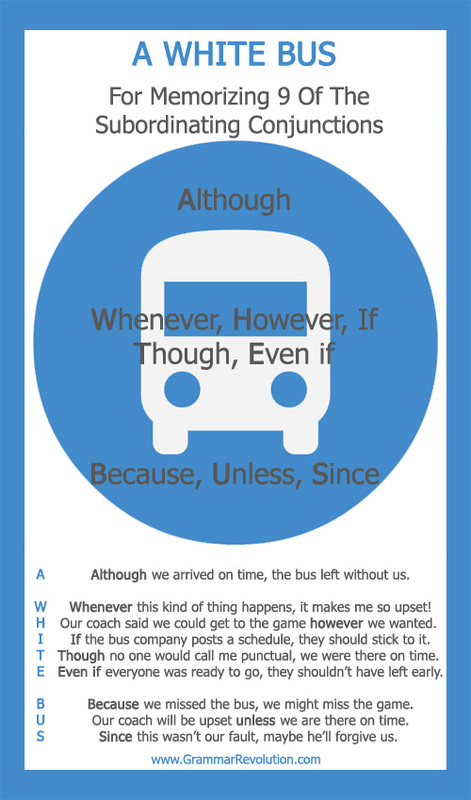 Some of the words in A WHITE BUS can function as adverbs or prepositions as well as subordinating conjunctions. That's one reason that I have example sentences for all of them. 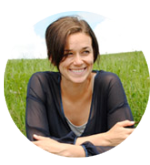 In the example sentences, the words are all acting as subordinating conjunctions. Let's look at the word since for an example. Check out these two sentences. 1. I'll pack my swimsuit since the hotel has a pool. 2. Fred and Ginger have been dancing on the dance floor since last night. Do you know which since is a subordinating conjunction? 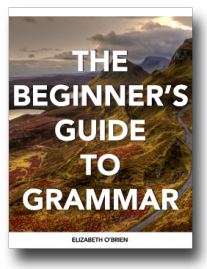 In the first sentence, since is followed by a subject (hotel) and a verb (has). This tells us that it's introducing a clause. That's right, folks. Since is a subordinating conjunction in the first sentence. I'll pack my swimsuit since the hotel has a pool. In the second sentence, since isn't followed by a subject and verb. It's followed by the words last and night. This tips us off that it's not introducing a clause. In this sentence, since is a preposition. Fred and Ginger have been dancing on the dance floor since last night. Just remember that you can't find words from this list out in the wild and assume that they are subordinating conjunctions. You must use that powerful brain of yours to figure it out. Memorizing lists and examples can be helpful, but don't lose sight of our goal: understanding how words work together. Most words can act as multiple parts of speech. 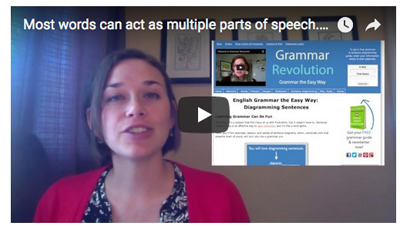 Teach or learn grammar with video lessons and sentence diagrams.